Vidalingua | BEST Language APPS | Download FREE | Get Fluent Fast! Learn languages fast! Have fun too! 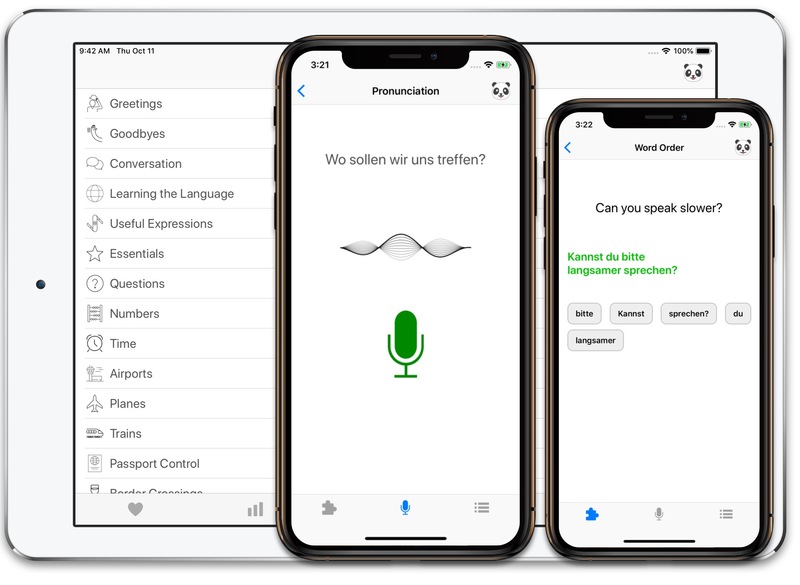 French English Translator + by VidaLingua transforms your iPhone, iPad or iPod touch into an advanced language interpreter, always ready to help. 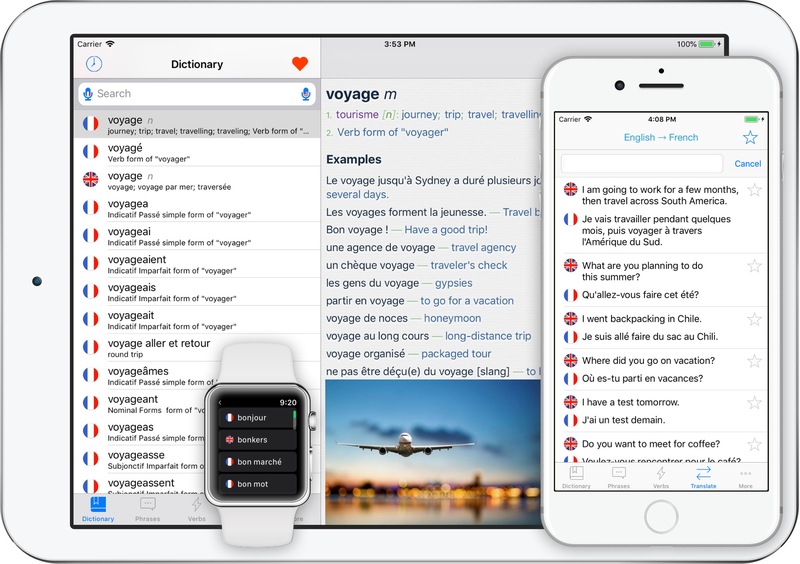 Extensive databases and advanced features make VidaLingua the most comprehensive French English Translator for iOS. Available in other languages. "What we've got here is an absolute must-have traveler's companion app for iPhone and iPad that you'll definitely want to take with you if you're thinking of visiting any Spanish-speaking countries this year. It comes with a translator, dictionary, phrase book & lots more." "Most comprehensive dictionary app... a must have on our beloved 'droids. Far more than a dictionary. There are examples of everyday sentences, verb conjugation and a simple yet fun quiz to practice vocabulary in your spare time." "The updated version of the Ascendo language apps takes things to a new level. 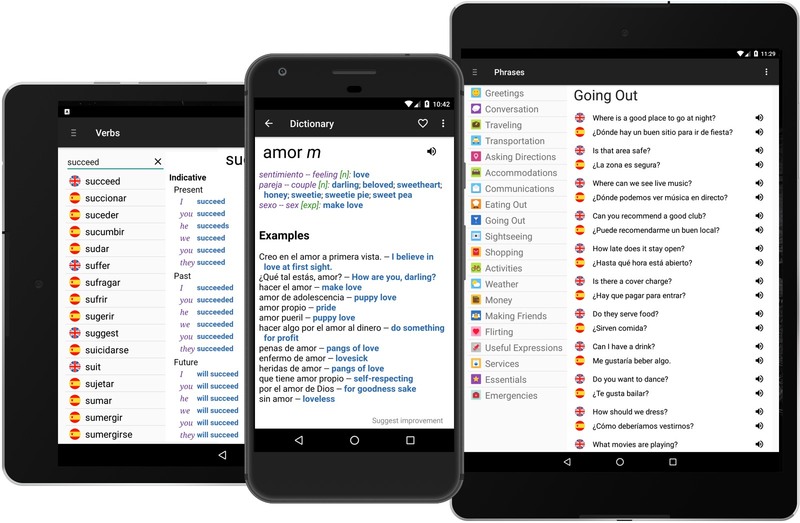 The developer's hard work seems to have paid off making the Ascendo language dictionaries serious contenders if you're in the market for a translation app." Spanish Translator & Dictionary + by Vidalingua transforms your Android phone or tablet into an advanced language interpreter, always ready to help. VidaLingua includes premium content and features making it the most comprehensive Spanish English Translator & Dictionary for Android. Available in other languages. Travel site PostcardZ from Victoria selects Learn Italian + for What’s Your APP-titude? article on best travel apps. The French Class selects Learn French + for iPhone & iPad to top the list of Best Apps to Learn French. Lonet Academy selects Learn Italian + for iPhone and iPad as one of the Fastest Ways to Learn a Language. Takelessons.com selects Learn Spanish + as the #1 Tutor-Approved App for learning Spanish on your iPhone. LovinItaly travel blog reviews Italian Translator & Dictionary + and calls it the perfect app to take along on your next trip. Teach me Français selects French Translator & Dictionary + to head it's list of Top 10 Apps for Intermediate & Advanced French Learners. Check out this great Youtube video of French Dictionary & Tran + for iOS by PorkyTheChop! VidaLingua selects Rio & Learn as one of the Best Schools to Learn Portuguese in Brazil. Free Apps for Me publishes reviews of PhraseMates and Japanese Transalator & Dictionary + for iPhone and Android. VidaLingua releases Japanese Dictionary + for iPhone and iPad availble now in the App Store. The French Line adds French Translator & Dictionary + for iOS and Android to article on Best Dictionary Apps to Learn French. Where To Go In adds Italian Translator & Dictionary + for iOS and Android to their travel guides for Rome, Milan and Ponza. TakeLessons adds French Translator & Dictionary + to their list of Best Apps to Learn French. Reto Bilingüe has added Traductor y Diccionario Inglés + to its directory of Games & Apps for learning English & Spanish. LinguaLift adds Japanese Dictionary & Translator + to its list of Best Japanese Learning Apps for Android. Japanese Dictionary & Translator for Android is now available on Google Play. Check it out! LiveWorkGermany.com rated German English Dictionary + and PhraseMates as the #1 & #2 best apps for learning German. Try our newest app, PhraseMates for iOS & Android. Learn a language. Meet a friend. Expand your world with PhraseMates! See videos of our Spanish, French, German and Italian dictionaries iPhone, iPad and iPod Touch on YouTube. Spanish English Dictionary + has been selected as one of top Top 101 Educational Apps by Best Online Universities. Learn German + by Vidalingua is the best app for learning to understand and speak German. Immerse yourself in real-life conversations you can use in the classroom or on a trip. Learn German + includes 101 lessons, 1190 phrases and 3536 exercises to help you become fluent in German. Available in other languages.